Ships in 18 to 19 business days. The Metal Filter Wrench for Standard Filter Housing is the last water filter wrench you'll ever need. 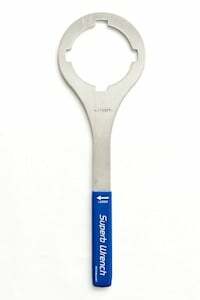 This metal water filter wrench is equipped with a longer handle for better grip and leverage. This filter wrench will not bend, bow or break due to its strong zinc-plated, galvanized steel construction. This filter housing wrench is labeled with a directional arrow to make sure you turn it in the proper direction.